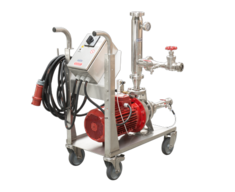 The flotation unit KSK is suitable for the pre-clarification of white or red must by means of centrifugal pumping. By the flotation process, the most is clarified under pressure after having been pumped with a flotation-gas (commonly air or Nitrogen). The tiny gas-bubbles tie the most particles, and then float them up to the top of the tank, to form a hard cap or ‘cake’ of particles. The most which is left beneath becomes very clear and is then pumped out from the bottom of the tank. For optimal results, it is recommended to use pectolyte enzyme or high-grade Gelatin to better bind the particles of the most to the gas-bubbles. Usage of active coal or Bentonite is also possible and effective. The remaining solid content in the must can reach to below 1%. The pre-clarification degree of the must can be determined by taking samples of the clarified must. By using air occurs a partial oxidation of the free phenols. The addition of gelatine can be done directly into the must tank or through the integrated spigot. For improved operation in flotation we recommend to add a curved-tube-sieve on the suction side. 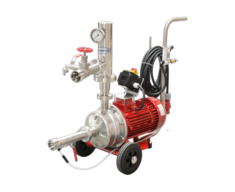 The KSK flotation unit is available in 6 sizes, with capacities between 6.000 and 50.000 l/h, dependent on the model size. The larger models - KSK 15.000, 20.000, 35.000 and 50.000 - arrive set on a stainless steel cart with wheels and brakes. The control board of the bigger KSK is set on the frame-handle at a convenient height. These units are ideal for wineries and fruit juice producers for whom fast, safe and simple must clarification is of great importance.